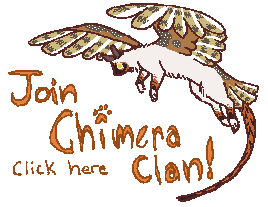 Omschrijving: ChimeraClan is a fan-made clan based off Erin Hunter's series, Warrior Cats, but with a fantasy twist. It takes place in a post-apocalyptic world inhabited by alien creatures, all mutated to survive in the harsh climate and to avoid getting eaten by even more horrible monsters. 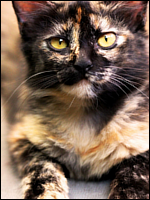 All the animals of today, humans included, have been wiped from the Earth, the sole remainders being the common house cat. Through a sacrifice by StarClan, these survivors have been able to evolve to replicate the creatures of the past, each becoming a 'chimera' of what was once before. However, while these powers grant them a better chance at survival, death is always knocking. They must stick together and hold out for a day of peace, to not give up hope and keep fighting for their place on this planet. ChimeraClan has moved to a new forum, click here to go to the new ChimeraClan. The new moderators are ♜Rook (inkwings) and ♦ ｔｈｅ ｍａｉｄ ♦ (themaid).